Cholderton Stonehenge Youth Hostel is situated just 4 miles from stonehenge and 10 miles from Salisbury. It is a family owned hostel but is affiliated with the YHA and was recently refurbished to provide 4 star accommodation. The hostel shares its site with Cholderton Charlie's Farm, entrance of which is included in the price of your stay. Rob Jolliffe is specified as the websites creator. 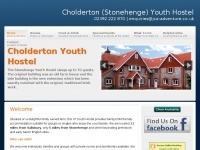 A profile of Choldertonyouthhostel.co.uk was found on the social network Facebook. The web server with the IP-address 35.176.100.85 used by Choldertonyouthhostel.co.uk is owned by Merit Network and is located in Ann Arbor, USA. This web server runs a few other websites, mostly in the english language. The websites of Choldertonyouthhostel.co.uk are served by a Apache server. The content management system Joomla! in the version 1.5 is used. The markup language of the website is XHTML 1.0 Transitional. The visitor analysis software Google Analytics is used to analyze the visitors of the websites. Both the inclusion of the website in search engines and follwoing of its hyperlinks is explicitly allowed.